Tuberculosis has a triad of symptoms namely: weight loss, low grade fever (at night) and chronic cough. When do we say that a cough is already a chronic one you ask? A cough lasting for more than eight weeks is considered chronic and I suggest that, in that case, you should consult a doctor immediately! If you experience the above triad of symptoms, don't panic right away. It doesn't always mean that you have tuberculosis. There is a diagnostic test that we can actually do to determine if you've been exposed to the M. Tuberculosis. It's called Mantoux test/ tuberculin test/ PPD test. It is done by injecting (yes it hurts!) 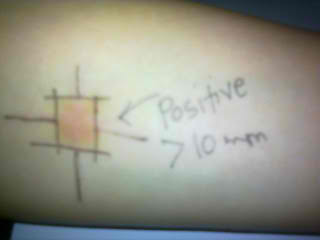 0.1ml of the Purified Protein Derivative into the layers of your skin, preferably on the forearm. Result is read 48-72 hours after the injection. There would be a reaction if you've been exposed to the bacteria. It's called an induration---a raised, palpable, hardened area. Take note that the area of redness is not measured. They told me it's positive! Having a positive result doesn't mean you have Tuberculosis. It only means that you've been exposed to the bacteria. You can have your chest x-ray taken or go do the confirmatory test for Tuberculosis---which is called Sputum AFB(Acid Fast Bacilli). People in the medical field (ahem!) are more likely to have a positive PPD reading as they are frequently exposed to patients who are carrying that bacteria. It is best to always wear a mask and take good care of your immune system to avoid getting the TB. Tuberculosis can be cured, if diagnosed early. 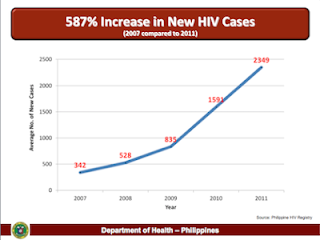 The Philippine government has this program called TB DOTS (Direct Observed Treatment Shortcourse). They give free medicines and monitor the patient's progress through the help of RHUs. It is just sad that people are scared to be tested because of the stigma that surrounds this disease. Piece of unsolicited advice: "Prevention is STILL better than cure. So, if you suspect somebody, or you know somebody who has TB, persuade him/her to get tested and of course, treated. We do not want to spread the disease, do we?" My father did this kind of a test. Yes, he really had TB but then after 6 months of taking medicines he had his sputum test. HE IS NOW NEGATIVE from TB. 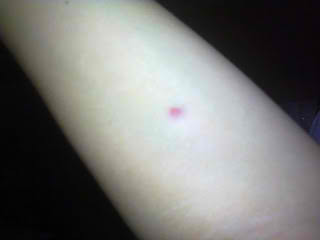 Now I know that the injection test for tuberculosis is called Mantoux Test. Today, people with tuberculosis has nothing to worry about because it can be completely cured now with medicines unlike before wherein people see it as a contagious plague. If one person used this method and the result is positive, he/she might go crazy and then after having another diagnose with the physician, the result can turn out to be the opposite. So I'm interested to know...What is the accuracy rate of this PPD reading? I like this post! Very informative.. yes, I definitely agree that prevention is better than cure! So let's all go back to basics.. eat more fruits and veggies!!! There's a stigma indeed. I hope people will smarten up and allow themselves to be tested instead of just living with it and "hope it goes away." These are helpful tips for easy detection of HIV and also promotes awareness on the disease. I can't remember if this test was done to me. Basta ang alam ko, I have most of a TB symptoms. But that ages ago. Drugs and alcohol was the culprit. Now I am learning. Great to know some more info about it. I am seeing a lot of hospitals displaying some sort of banner with the letters DOTS in them. Now I know what does it mean. Thanks! I didn't had to go under this test when I was diagnosed to have PTB. I immediately coughed out blood that time. Good thing TB nowadays can be cured with medicines. It may sound technical to me, but I do believe this post is such a great help especially in promoting awareness on the disease. I love how you've made me read a topic that I've thought would be boring. It was informative. And I really think it's painful because they'll inject something in which was more painful than just giving blood samples.